I've been working on this shawl since July and am only about 20% done. I had hoped to be done by fall. - Missed that mark by a long shot! The pattern is Madli's Shawl from Nancy Bush's book "Knitted Lace of Estonia". I am doing it in a silk/yak blend cobweb weight yarn that is a beautiful taupe color. Because the yarn is so fine, it is slow going and very fussy. I like the result, but it is much harder to work than laceweight yarn, which my other shawls were done in. Next time I think I'll go back to laceweight for a big project. 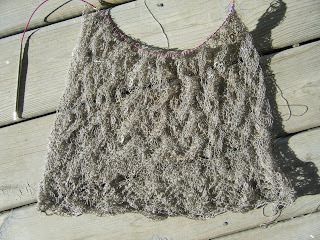 Lace looks clumpy and messy until it is blocked. That's the last step in the process which really brings out the beauty of the stitches. 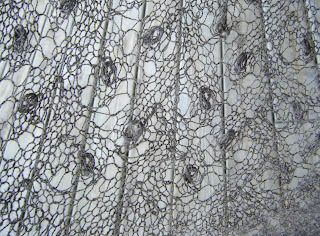 Even this last picture with the lace spread out gives only a hint of what the finished shawl will look like. The little balls of yarn you see in there are called "nupps" and are a feature of Estonian lace. They add a lot of interest and texture to the pattern. Because I've been running out of steam on the shawl, I've been knitting socks and hats. I'm working on another hat now, my first try at stranded colorwork. (Just two colors though.) It is quick and going fine. Maybe this weekend I'll get back to the shawl for awhile. I would like to see it finished. I want to learn from you! I have three scarves started...how many scarves can one person wear?